I’m in the middle of a crazy week inside of a CRAZY month! This is so much fun…. 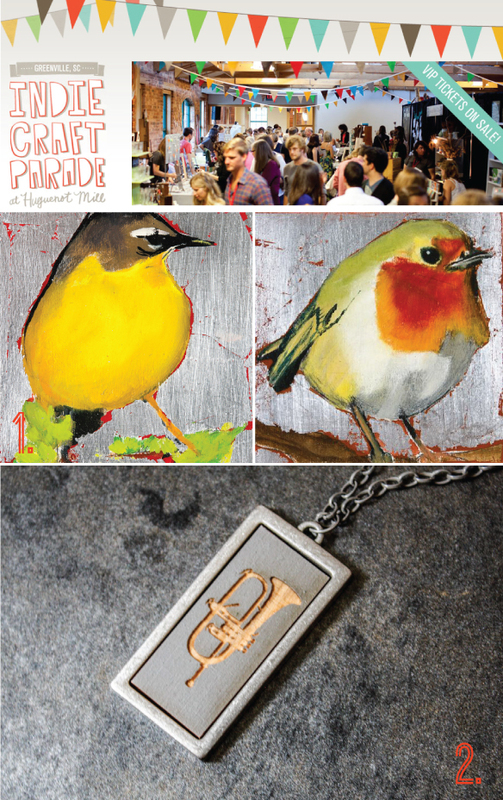 This week is pretty much engulfed (in a good way) with the upcoming Indie Craft Parade which starts on Friday! I have a few last minute touch ups to make, signs to make, info cards to create, packing to do… you get the idea. I just love these events. They’re so exciting and wonderful and I LOVE meeting new art and design lovers. My blog posts will be a little weird over the next week. Follow me on Twitter and instagram to keep up with all the fun! And…. if you’ve had your eye on a piece of artwork (collage, oil painting, necklaces…) now is seriously the time to buy it (before the show, and before someone else swoops in and scoops it up!) I will be closing my online shop tomorrow night! PS. If you are looking for an item not listed in my shop, just send me a message!! It might still be available! Above are a few of the other Indie Craft Parade participants! I can’t wait to meet these creative people in a few days! just found your blog today and i am loving it! I love everything u post!